In the previous post, we continued with the argument that many religious adherents assert, that God created the universe and all life, with only some minor changes coming from evolution thereafter. Given those premises we then asked, Why did He leave clues to suggest something else is going on? Let me offer a solution for the creationist: because it’s interesting. It’s just like a crate of novels and puzzle books we might find on a deserted island. It is completely unimportant that none of the books are ‘true.’ They’re interesting. They’re challenges, they provide us with enjoyable experiences. After all, what is life but a series of challenges and puzzles, to survive, to reproduce, to feed, protect and educate our children? And for the religious, it is important to realize that perhaps none of our struggles here are ‘true’, or at least they’re not permanently true. If one believes that heaven is the ultimate, eternal truth, then what happens here is a very brief prologue — an illusion, some theologians would argue — for a much greater reality. Puzzles. Challenges. These are a large part of life, perhaps they are all that there is to life; perhaps they are even the “meaning” of life. So if you believe in God, clearly He has placed all sorts of puzzles in front of us, that he expects us to explore and solve. What difference does it make if the puzzles are in the fossil record or in a crossword puzzle? Why should it matter if the dots we connect represent a true path through history? Trying to connect them is one of the puzzles in front of us, and biology represents one of the most fun and fascinating games I know of. It’s not important that the puzzles are true, only that they reveal some truth. Think of them as scientific parables. With that, I should point out that philosophy has pretty much given up on truth, concluding that we simply move from paradigm to paradigm. Or continuing with my puzzle metaphor, we keep solving new puzzles from the same set of data; and as we do, we keep coming up with more interesting solutions for the puzzles. So I see the puzzles as a way to interact with the marvel of life that surrounds us; and just as with many mathematical and conceptual models, whether they accurately describe the world is unimportant. It is enough that they are useful, and helpful. 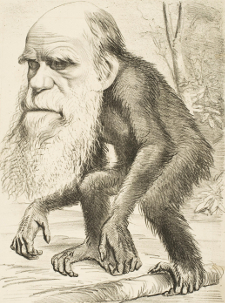 Picture: Charles Darwin as an ape, courtesy of Wikimedia.org.